This adults version of traditional basil pesto is always a winner: Every time I make this and serve it to friends, I get asked for the recipe. I figured that’s a good reason to share it with you! I can’t get enough of this pesto and I love it because it’s so versatile: Delicious spooned over simple pan-fried fish, or a chicken breast… Put a dollop on roast veges… Stuff it inside a chicken breast… Use it as a dip… Mix it up with cream cheese for a more indulgent dip… Or, toss through hot pasta for a quick grown-ups dinner: You get the idea! 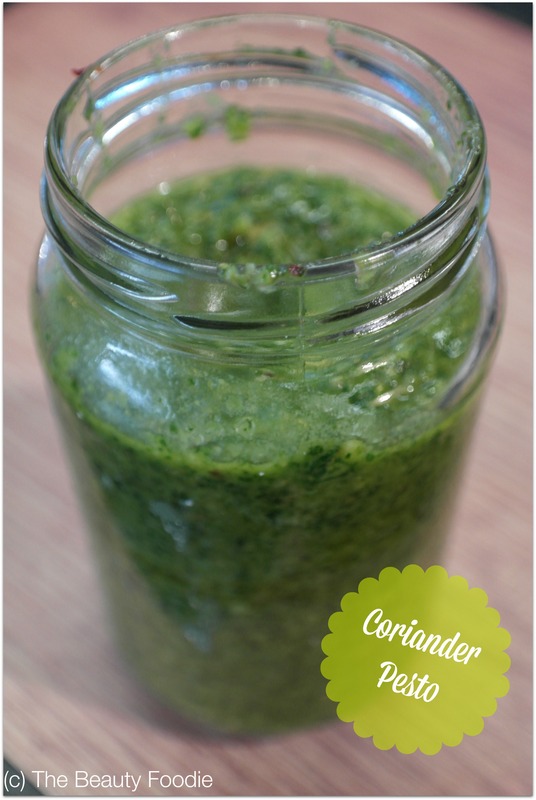 Alternatively, if you aren’t a coriander fan – simply replace it with another cup of basil. Easy. 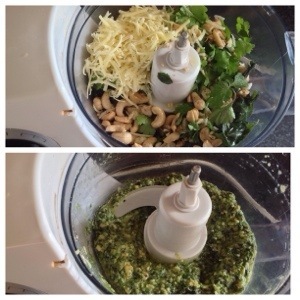 By the way, traditionally pesto is made with pinenuts: I never use them, as they are so damned expensive, I don’t feel like remortgaging my house to buy them so I use cashew nuts instead. You can use walnuts too, but I love the taste and the creamy texture you get from using cashews, hence the name of the recipe. Step 1: Biff everything in the food processor*, turn it on and blitz it till it’s finely processed. Because of the cashew nuts it will go quite creamy. Step 2: Transfer to a sterilised jar – keeps in the fridge for a couple of weeks. *If you don’t have a food processor, make smaller quantities and use a mortar and pestle.